← Guest Blog on Penumbra! I recently wrote a guest blog post for Penumbra eMagazine. When I received that email from the blog manager asking if I was interested in writing a guest blog, I felt really pleased and flattered they asked me. That was my first reaction. My second reaction was panic. What would I write about? We went for a family hike up Little Si, North Bend WA, on August 25. 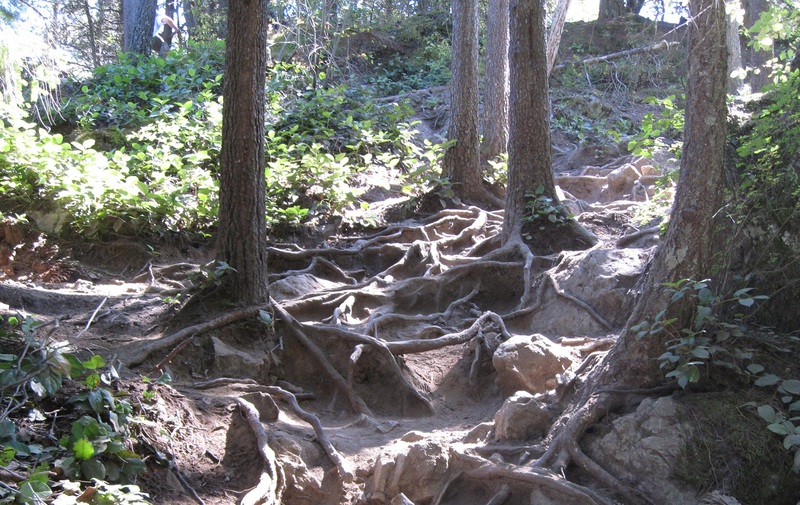 View of an interesting part of the trail, with criss-crossing tree roots. I often think there is a certain arrogance or audacity to keeping a blog about becoming an author, especially since I am not in any way an expert on (well anything really, but especially) writing. There are many other blogs on the internet written by widely published authors who can give far better advice than me. (Links to some of my favorites appear in the “Resources for Writers” table on the right.) When I blog I try to stick to my own experience and the perspective of a writer just starting out and trying to get published. So for my guest blog, I wrote about something that was going on in my life (sorting through my family’s collection of children’s books) and related that to writing speculative fiction. Love You Forever by Robert Munsch, illustrated by Sheila McGraw – I cried every time I read this to my kids. Miss Rumphius by Barbara Cooney – What will you do to make the world more beautiful? I Love You, Stinky Face, by Lisa McCourt, illustrated by Cyd Moore – This is the very last picture book my kids asked me to read over and over. The Paper Bag Princess, by Robert N. Munsch, illustrated by Michael Martchenko – Princess Elizabeth is one of my all-time favorite heroines! So now I’ve written a blog post about blogging. (Hopefully that’s not as lame as it sounds.) What are your favorite children’s books, and how have they influenced your writing? This entry was posted in Writing Path and tagged blog, editing, guest blog, Penumbra, publish, writing. Bookmark the permalink. Aw, Frank. You write the sweetest things;-) Just remember, I know where YOUR blog is! I retract my previous comment!